So...Tell Me Again...What Does Small Mean? Those of us who have been around for a long time (don't call us old) are often a little discouraged by the physical size of current gear. For sure, modern composites and plastics have resulted in extremely light, but very capable equipment, but the bulk is pretty daunting. Back in the day, you could easily slip your OM-1 or Pentax MX mounted to a fast normal lens into your a jacket pocket. Life was simple. As such, I was feeling pretty smug about my wise choices in vintage gear. My mainstay 35mm SLR for the last several decades has been a Ricoh XR7 mounted to a Pentax-M 50/1.7 normal lens. The combination is light, fast, and very compact. May I also brag that I last replaced the batteries about two years ago and those cells are going strong? That smugness was given a severe jolt this last week when I took delivery of two FSU (Former Soviet Union) rangefinder cameras. Now you can say what you might about my Zorki 4K and Kiev 4AM. They are what they are and my expectations were not particularly high. 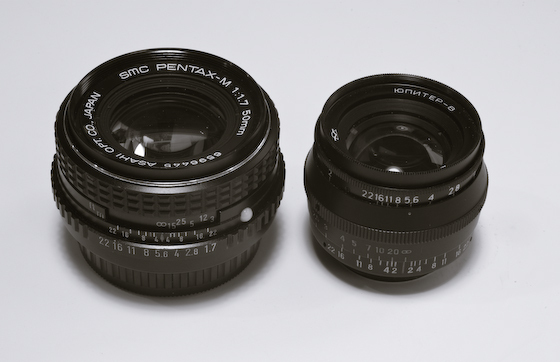 Now the Pentax-M 50/1.7 is one of the most compact normal lenses ever produced by Asahi. (The Super-Takumar 55/1.8 is slightly smaller at about the same weight.) That being said, it looks positively pudgy next to the J-8. I suppose I could have added the Helios-103 50/1.7 to the mix, but it is somewhat taller in its mount and does not convey quite as convincingly that it is actually a little smaller than even the J-8! It is also not a fair comparison since the Helios does not have its own focus helicoid, but instead uses the focus mechanism built in to the camera body. So, why should this size discrepancy be? The answer that I have read is that these rangefinder camera lenses are not burdened with the bulk and weight associated with the automatic aperture mechanism. More importantly, while the rangefinder optical designs are every bit as sophisticated, the SLR lenses also have to support the long registration distances required by the mirror box. The result is larger elements and more complex designs. I will be sharing more on my adventures in FSU rangefinder land in future posts. For now, I will have to wait until both cameras get back from the shop. Yep, both had fatal issues that required some attention from the repairman. I have tried Leica M7 with the M lenses in Leica from a friend of mine and I found small is relative and those Leica M lenses are tiny and one that I tried has a 30.5mm filter size. I have some product shots of the M7 as well as a test roll. Hin, I have also sometimes been surprised that some rangefinders I thought were compact based on pictures that I'd seen actually have bodies of similar bulk to many SLRs. The Leica is an example--has relatively petite lenses but the body itself is not as small as I'd thought.